The Songs of Eretz Poem of the Day for March 18, 2014 is "study eight" by William Kistler. 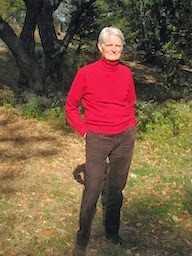 A link to the poem as well as to several other "studies" by Kistler may be found here: http://williamkistler.com/poems/. The poem also appeared in the January/February issue of American Poetry Review, along with nine other studies and an informative "afterward" by the poet. William Kistler (pictured) is the author of five books of poetry. "study eight" appears in his latest book, In the Middle of Things. Mr. Kistler was on the board of Poets and Writers for many years, and is the co-founder of New York's Poets House. Additional information about Mr. Kistler, as well as about his latest book, may be found here: http://williamkistler.com. As Mr. Kistler reveals in his "afterward" in American Poetry Review, he begins his "studies" without capitalization and ends them without the use of periods, symbolic of beginning "in the middle of things." He describes his style as a type of narrative, not quite poetry. There are certainly narrative elements in "study eight," in that a story of sorts unfolds as one reads. However, there is a quiet, lyrical, dream-like quality, and a gentle rhythm in "study eight" (and in the other "studies"). These elements create a distinct and enchanting voice that is undeniably poetic.